I’m a “Super Randonneur” again.. 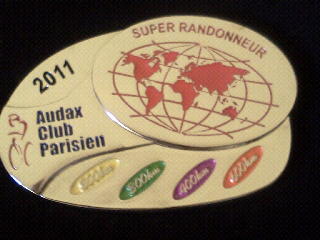 The Super-Randonneur award is awarded for the completion of 200km/300km/400km/600km rides within a Randonnuering year (Nov 1 – Oct 31). It is also the qualifying requirement for many 1200km events, which was my primary motivation. This is the second time I have completed a Super-Randonneur series, the previous time being while qualifying for Paris-Brest-Paris in 2011. Here is the 2011 medal, I’ll need to wait a while to see what the 2013 edition looks like. It is often argued that 400km brevets are the hardest to complete due to being longer than a 300km, but not reducing the average speed enough for a sleep break like a 600km brevet. So, naturally that is what I started with, jammed into the Christmas crunch, was our Marlborough Mayhem 400km brevet. With a desire to qualify for 1200km ride further afield later in the year, I promptly rescheduled my flights home for Christmas and booked a ferry across Cook Strait and back again. As I rode up the long false flat that is the Wairau Valley the misty morning cleared albeit, not enough to allow us to see the mountain vistas of this area. As St Arnaud approached the false flat was replaced by real climbing as we made our way up to this alpine village. With Elaine's cafe which I frequented on many a past tramping trip no longer trading, I bought a snack from the general store, before heading to Kawatiri Junction and up over the Hope. It was soon obvious that I was not a climber as I struggled up the steep pitches. I had a brief flat patch, with zero energy and feeling mildly faint just before reaching Nelson and had to stop for an emergency snack on the cycle way, just moments away from Nelson. I must say that I was very impressed with Nelson's integrated, and signposted cycle network. Leaving Nelson required climbing the Whangamoa Hill, with sea fog set in on a warm and humid night. There was another bump before dropping into the Rai Valley and onto Havelock well after the shops had closed for the night. I waited a few minutes for Rita to arrive but unfortunately it getting too late, and tiring, she chose to abandon and take a 20km shortcut back to Picton via the hillier route on Queen Charlotte Drive. Meanwhile I proceeded the flatter, but more distant route via Rapura Rd, although I will admit that I did sneek in a much needed needed a ten minute snooze to manage my tiredness en-route back to Picton. After Christmas I returned home to Wellington and was joined by Tim and Simon. We were able to meet Paris-Brest-Paris ancien Ed Allen for a snack at our first control in Carterton. Before the devastating heat of the afternoon kicked in, with the thermometer well over 30 degrees for most of the day. In Wellington we think it hot if it reaches 20 degrees! This led to us many time consuming rest-stops to eat more ice-creams, in all contributing to over four hours off our bikes. It briefly looked like we may have had up to five riders for the 600, but after late withdrawals, it was just ride organiser Rita and myself. Two days beforehand we swapped the route around so that more services would be open, and the overnight rest stop at Murchison could be at 382km instead if 440km. This seemed like a good idea - until getting our bikes at 5am on Saturday morning and riding into a headwind up the long false flat that is the Wairau Valley. At the top at St Arnaud we were a mere 40 minutes ahead of the time limit, so it was starting seem a tad tight even at this early stage. Time for fruitful hours of sleep was already seeming unlikely. We met up with Kiwi Randonneurs stalwart Duncan and Tony in Murchison, where after 290km into the headwind Rita decided it wasn’t much fun and chose to abandon. As for me, this was the only 600km ride I had available for qualifying so I pushed on into wind and rain down the beautiful Buller Gorge to Westport, where all businesses decided to celebrate my arrival at 9pm by either closing or ceasing to be serving anymore food. So, it was nuts and snackbars on a concrete step outside New World (thanks for the extra snacks Duncan – was looking grim). Then it was a climb up to Murchison for a 90 minute sleep in the motel before setting off over the Hope and into Nelson. No sign of the rain of the Buller from the night before as a sun shone and the temperature soared, especially felt when climbing over the Whangamoa Hill. The strategic placement of a control point at Pelorous Bridge for a good pie, didn’t quite work out as all I wanted was anything frozen to help cool me down before the final push around Queen Charlotte Drive and back to Picton. This was “multi-sport” weekend for Kiwi Randonneurs, with Rita backing up from a half-ironman the day before, and myself from an ascent of Mt Taranaki. I mostly rode with Andrea who was visiting from Brazil, although I wasn’t sure if I was going to finish when I broke two spokes near Stratford. Thankyou ‘Z Stratford’ for the loan of some tools, which enabled me to loosen the in tact spokes so the wheel would turn between the forks and enable me to complete the ride, and my Super Randonneur Series. Our route was a variation on the Round the Mountain which would have only been 150km. Ironically, some of the best riding was in the quiet rural roads, and the scenic finish along the New Plymouth Coastal Walkway (a shared path) which had been added to bring the distance up to the required 200km.